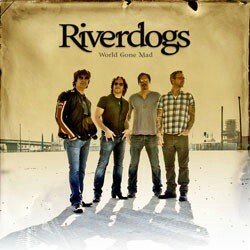 The Riverdogs are set to return with their first album since 1993 entitled ‘World Gone Mad’. The album is slated for release on September 30th through Melodic Rock Records — www.melodicrockrecords.com. Riverdogs was formed by vocalist/guitarist Rob Lamothe and bassist Nick Brophy. Following an introduction to the guys, Vivian Campbell (Def Leppard, ex-Dio, ex-Whitesnake) agreed to produce Riverdogs’ first demo. Vivian was so impressed by their talent, he joined the band for their debut-album, released on Epic Records in 1990, winning a prestigious Edison Award in The Netherlands. Soon after, drummer Marc Danzeisen joined the band to complete the line-up. Though fans and critics gave the album a warm reception, lack of support from their record label eventually led the band to go independent, with Campbell departing the line-up. Releasing another two albums in Europe, the band continued to pick up fans before eventually disbanding. Campbell settled into the Def Leppard lineup and Nick Brophy become and continues to be a respected engineer and producer. Rob Lamothe continued an acclaimed solo career and Marc Danzeisen an in-demand session player. In 2003 the band gathered again to record new material and play a few reunion shows. Those new songs were recorded as demos, but never completed. In 2010 MelodicRock Records approached band manager Paul Liszewski about a possible release of these songs. The band liked the idea so much an agreement was reached and over the course of a few week long get-togethers, the line-up of Lamothe, Campbell, Brophy and Danzeisen recorded final versions of the 2003 tracks as well as writing a couple of brand new songs. Added to the new ‘World Gone Mad’ album is one live cut from the band’s 2004 re-union shows, a cover of the Badfinger classic “No Matter What”. ‘World Gone Mad’ is the fulfillment of a long promised release of new Riverdogs material. The band’s faithful fanbase are rewarded with 7 new Riverdogs classics, issued at a special price.